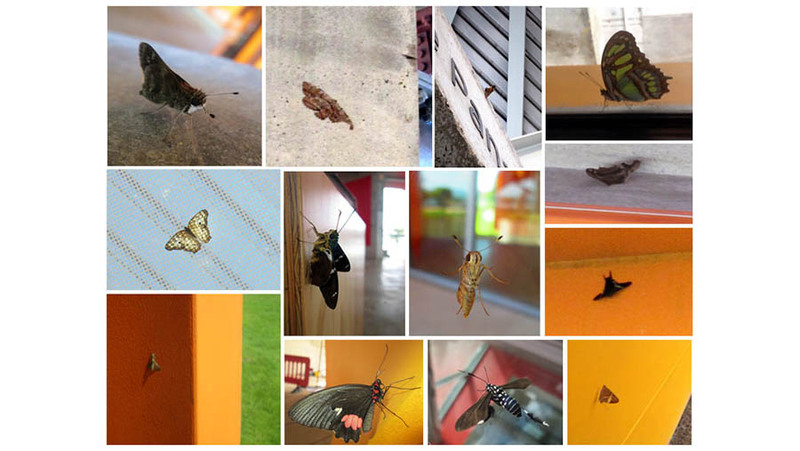 Ahead of Gehry’s Biodiversity Museum‘s opening in October 2014, PhD candidate Patricia Esther Corro Chang, Universidad de Panama, studied the butterflies and moths which had been attracted by the bright colours of the walls and which were visiting the grounds of the tourist site. The resulting checklist, published in the open access journal Biodiversity Data Journal, aims to both evaluate the biodiversity and encourage the preservation and development of the Amador Causeway (Calzada de Amador) and the four Causeway Islands. The name of the islands derives from their being linked to each other and the mainland via a causeway made of rocks excavated during the construction of the Panama Canal. The researcher reports a total of six butterfly and eight moth families, identified from the 326 specimens collected over the course of 10 months from the botanical garden of the museum and adjacent areas. They represent a total of 52 genera and 60 species. Interestingly, the eye-catching bright colours of the walls of the museum seem to play an important role for the insect fauna of the area. Not only are numerous butterflies and moths being attracted to the site, but they also express curious behaviour. On various occasions, for example, a species of skipper butterfly was seen to show a clear preference for yellowish surfaces. In their turn, a number of butterfly predators, such as jumping spiders, are also frequenting the walls. The article in the journal provides knowledge of the butterfly and moth fauna at the mainly vegetated study area, located on a narrow strip of water distant from the city of Panama.